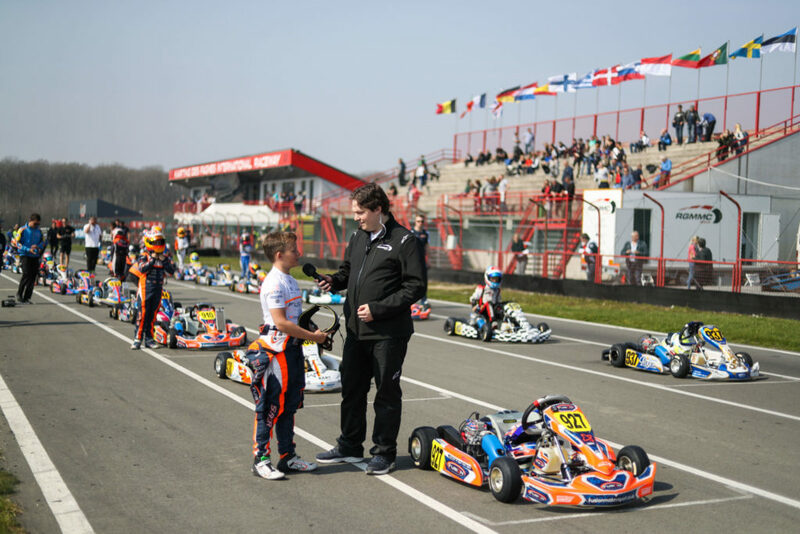 The opening round of the IAME X30 Euro Series welcomed this weekend in Mariembourg, in Belgium, more than 170 drivers representing 20 countries, an increasing entry list compared to 2018 that highlights the growing success of the competition over the years. 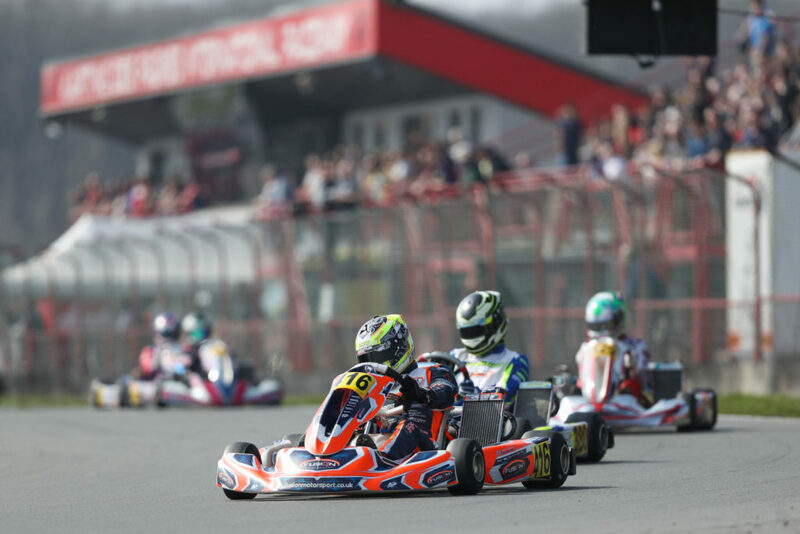 Run in beautiful conditions on the 1366 meters of the Karting des Fagnes International Raceway, the Finals on Sunday delivered their verdict with the first wins of the season going to Freddie Slater in Mini, Jason Leung in Junior, Callum Bradshaw in Senior and Philipp Seewer in Shifter. 416,Bradshaw Callum(GBR),Fusion motorsport(EXPRIT/IAME/MG), Mariembourg, 31 March 2019. IAME Euro Series, © 2019, Alexandros Vernardis / The RaceBox. This first weekend of the IAME X30 Euro Series proved to be successful, not only on track where thrilling racing unfolded in all categories between some of the best international karting drivers but also on the sidelines thanks to the perfect organization put together by promoter RGMMC always seeking to meet the expectations of teams, drivers and fans alike. Out of 79 drivers, 34 took part in the Final race of an eventful Senior category. Leader of the Heats, Lewis Gilbert (Persistence) kept the pressure on by taking the Prefinal win ahead of the ultimate showdown. From Pole, The 2018 Euro Series Junior winner jumped well at lights out to lead the opening lap of the race. From third on the grid, Callum Bradshaw (Fusion Motorsport) gained a position on the Dutch Niels Koolen (Evolution) before the two went past Gilbert on lap 2. The leading trio quickly opened the gap over the rest of the field including Elie Goldstein (VDK) and Mark Kimber (Strawberry Racing). As the race went further, Clayton Ravenscroft (KR-Sport) overtook Kimber for 3rd as the defending Senior winner found himself battling against Joey Van Splunteren (Evolution) who recovered from a first few troublesome laps. The Dutch went past his rival to get close to Ravenscroft for 2nd place until the very last lap where the two touched wheels and opened the door to Kimber who snatched the final podium’s step in a dramatic finish! At the front, Bradshaw kept a one-second gap over Niels Koolen to win the opening round of the Series with Kimber finishing third ahead of Van Splunteren and Gilbert. Crossing the line in 6th, the unfortunate Ravenscroft was penalized (front fairing) and tumbled down the order to 13th overall. Danny Keirle (BirelART Middle East) recovered the top 6 in front of Filip Vava (KR-Sport), Hannes Morin (Dan Holland), Georgi Dimitrov (Fusion Motorsport) and Sean Butcher (Mick Barrett Racing). Click here for the full Senior classification. In the points ranking, Callum Bradshaw is ahead with a mere two point-lead over Niels Koolen (87 to 85) followed by Lewis Gilbert in third at 82. 74,Leung Jason(CAN),Kr sport(KOSMIC/IAME/MG), Mariembourg, 31 March 2019. IAME Euro Series, © 2019, Alexandros Vernardis / The RaceBox. The Junior class was divided all weekend with different names topping the charts every step of the way leading to Sunday’s Final. If the Swedish driver Wigot Edqvist (Strawberry Racing) set the fastest lap time on Friday, it was the Brit Josh Rowledge (Strawberry Racing) who led the provisional ranking before Joseph Taylor (Coles Racing) claimed the Prefinal on Sunday morning. The Final produced a fourth different winner in the form of the Canadian Jason Leung (KR-Sport) who emerged in front of his KR-Sport teammate Oliver Bearman. The Final top ten classification was partially updated due to front fairing and driving penalties given to Edqvist (24th), Kris Haanen (13th), Polesitter Joseph Taylor (14th), Lucas Leistra (18th) and Cian Shields (19th). Consequently, Marcus Luzio (Privateer) recovered the 3rd place before Oliver Gray (Dan Holland Racing) who contained for 0.092 seconds Freddie Spindlow (KR-Sport) on the line. Alex ley (Coles Racing) was ranked in 6th followed by Herolind Nuredini (Evolution) whose race turned into demonstration with 25 drivers overtaken in the course of 14 laps, Tom Lebbon (MLR), who also climbed up the field from 28th, Ruben Volt (DHR) and Alfie Rigby (KR-Sport), both having also recovered a good pile of positions (click here for the full Junior classification). In the points ranking, Jason Leung (85) only has one point advantage over Oliver Bearman (84) and three from Oliver Gray (82). Fastest in Qualifying, victorious of all the Heats and the Prefinal, Freddie Slater (Fusion) added to his tally the most valuable win of all by dominating Sunday’s Final in the Mini category. 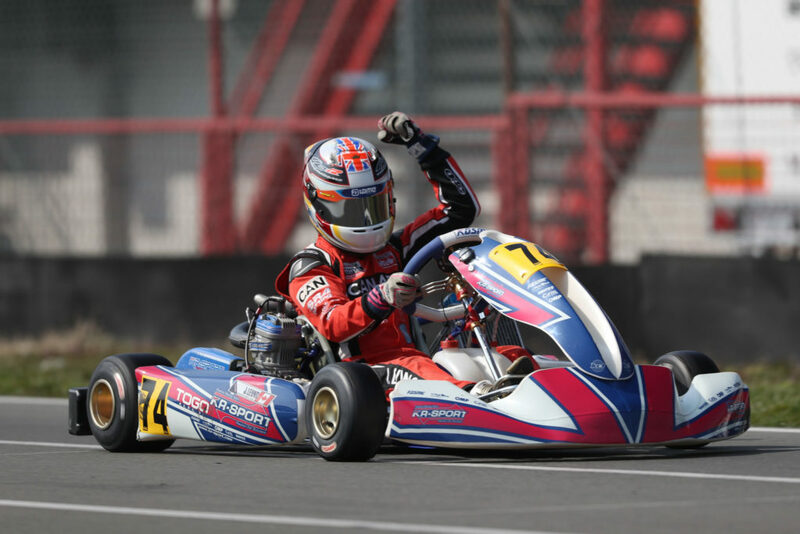 The Brit put up a solid performance from Pole position to claim his first success of the year defeating by 1.588 seconds Panama’s Sebastian NG (Team Driver Racing Kart) with the Spaniard Lucas Fluxa (Praga Espana Motorsport) on his tail (0.231 seconds) to complete the podium. Leo Robinson (Fusion), despite jumping ahead at lights out from second on the grid, lost ground to end up in 4th place. The Dutchman Rene Lammers (PDB) concluded a strong weekend in 5th ahead of a recovering Guillermo Delgado Martinez-Aci (Fusion Motorsport) who climbed up the order from 18th on the grid. His teammate William GO (Fusion Motorsport) crossed the line behind before a 5-second penalty (front fairing) pushed him down the order (14th). Sacha Van’t Pad Bosch (PDB) inherited the 7th position ahead of Edu Robinson (Fusion Motorsport), Patrice Kowalewski (Privateer) and Dylan Visser (TK Racing) who entered the top ten due to William GO’s penalty (click here for the full Mini classification). In the points ranking, Freddie Slater is leading with 89 points followed by Sebastian NG (84) and Leo Robinson (82). 601,Delre Thierry(BEL),Delre-racing(MACH1/IAME/MG), 606,Seewer Philipp(CHE),Spirit-racing-ch(KOSMIC/IAME/MG), 604,Ludi Kevin(CHE),Spirit-racing-ch(KOSMIC/IAME/MG), Mariembourg, 31 March 2019. IAME Euro Series, © 2019, Alexandros Vernardis / The RaceBox. 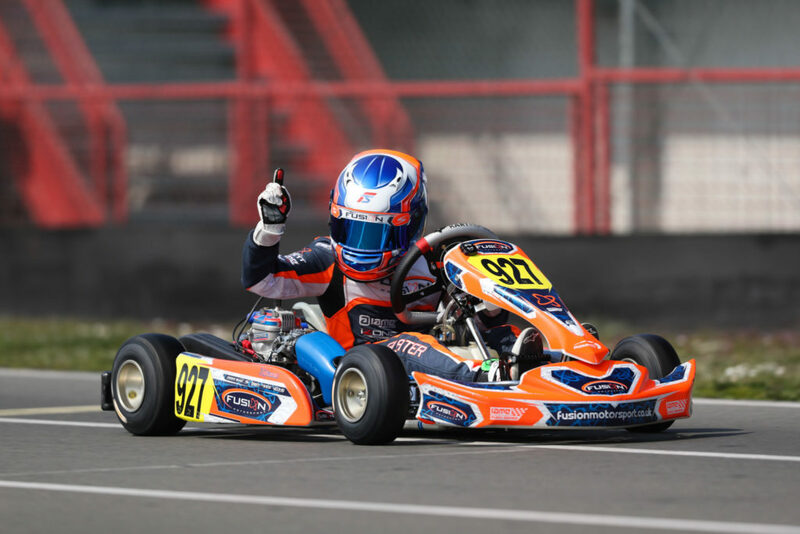 Philipp Seewer (Spirit-Racing) concluded his weekend on a high note in the Shifter category. The Swiss driver started by clinching Pole position on Sunday morning thanks to a win in the Prefinal before laying hands on the final trophy a few hours later. 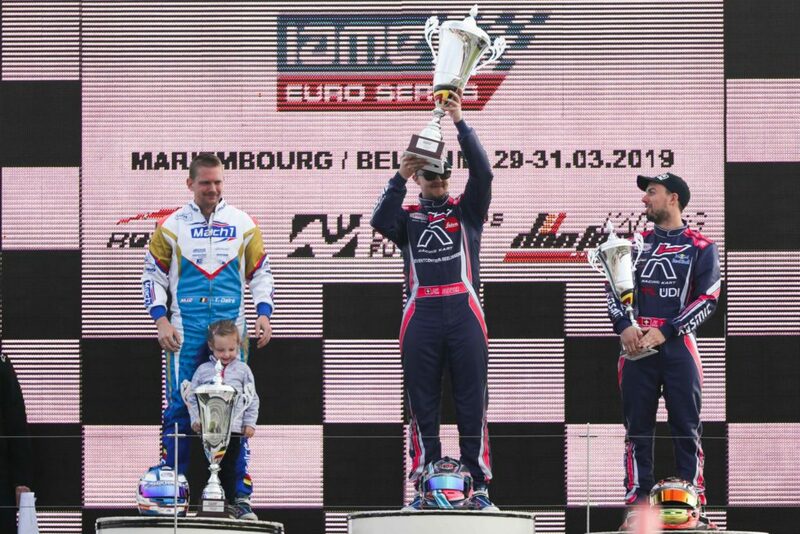 Defending Euro Series winner Thierry Delré (Delré Racing/Mach1 Motorsport) joined him on the second step of the podium. A happy end for the Belgian whose weekend was largely compromised by mechanical troubles before a third place in the Prefinal put him back in contention for the win that he eventually missed for 0.478 seconds. On Pole on Friday, Kevin Lüdi (Spirit-Racing) crossed the line further back in third place in front of Dionisis Liveris (Daems Racing Team), Michel Biffiger (Spirit-Racing), Erik Hellemans (DFK) and Laurent Malice (Delré Racing Team). Click here for the full Shifter classification. In the points ranking, Philipp Seewer is the first leader of the season with 89 points, five more than Thierry Delré (84) and eight over Michel Biffiger (81). The next stop of the 2019 IAME X30 Euro Series will take place from May 23rd to 26th on the 7 Laghi circuit of Castelletto di Branduzzo located south of the city of Milan, Italy.